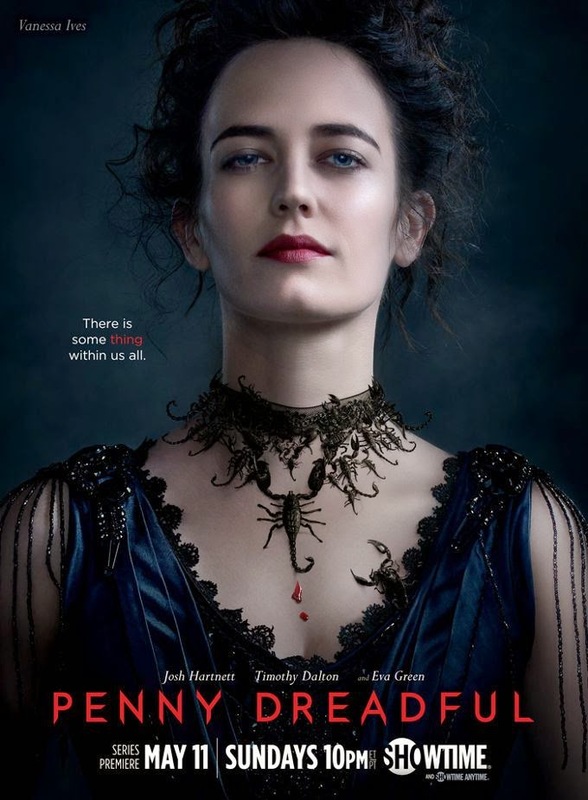 THE FINE ART DINER: Penny Dreadful: What Does the Scorpion Symbolize? 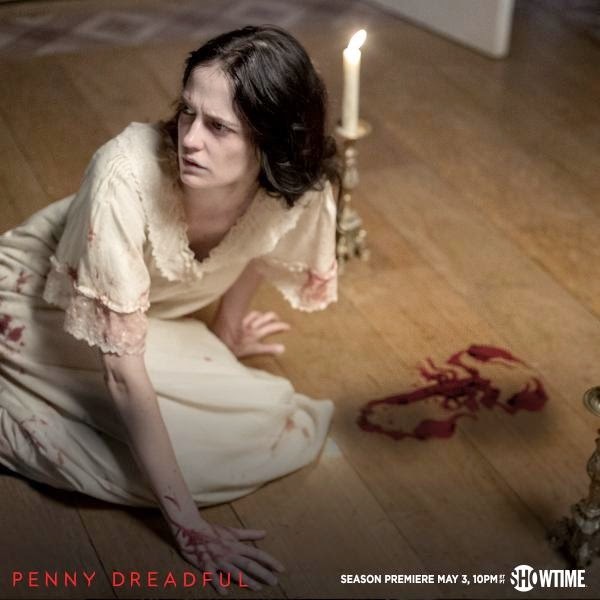 Penny Dreadful has associated the character of Vanessa Ives (Eva Green) with the scorpion, but what does that mean? What does the scorpion symbolize for Vanessa? Now that we have seen the first episode of Season 2 (which you can watch here) we can deduce what it means and why. First of all, it's important to know that a scorpion would rather sting itself to death, than allow itself to fall prey to a predator, and this is most likely prophetic of Vanessa and actions she will take later on. It's a sign of the incredible writing skills of the film makers that Vanessa uses the straight razor to cut her finger; why? The razor blade invokes the hairless witches attacking her; how? We know that hair symbolizes our thoughts, so for the three brides of the devil to have no hair, means they have no thoughts, they have sacrificed their free will to their appetites and so they have also sacrificed the capacity for thinking and reasoning, because those are gifts from God. In order to NOT become like them, Vanessa enters into a covenant with God: she cuts her thumb; why? It's our thumb that (physically) separates us from the animals: animals don't have thumbs, but we do, which allows us to do more than animals. Slicing her thumb also acts as a kind of circumcision of her own appetites: because she is not an animal (she has a thumb) she is going to curtail her animals appetites (like for Dorian Gray, or anything else) and because she is not an animal spiritually, she is going to enter into a covenant with God and giver her inner-most being, her deepest desires, hopes and fears, to Him. 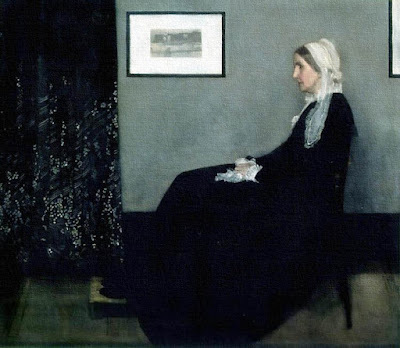 If you will notice in this image, Vanessa's gown is the same color as the candle and the flame, so we can take this as a wedding dress, her bridal garment, as she says the prayers that pledge her soul to God and ask Him to protect herself as His own daughter (like Sir Malcolm, but on a greater scale, because Sir Malcolm is the father who couldn't save his children). Lastly, we can say the blood all over Vanessa's gown is akin to the soul's virginity, the breaking of the hymen at consummation, that God has accepted her as His bride; what does that mean? This is imperative for all of us to understand, because if we are not fighting the same spiritual battles Vanessa fights, then we are losing, and we are, in reality, no better than the witches who have abused their gifts from God. God isn't going to save Vanessa, nor will He save us from our spiritual battles, but He will give her the strength she needs to win them, just as He gives us the strength we need to win, and that is, essentially, the reason why all this has happened: the devil wants Vanessa because Vanessa is very drawn to the devil and everything about the devil; but if Vanessa resists the devil, she gives glory to God and that will defeat the devil. Vanessa has now taken God as her ally, in spite of her past and disbelief, she knows how close she is to becoming like the witches, and she's terrified of it, so she is saving herself, even as Evelyn Poole condemns herself even more. Vanessa has been assaulted by the bald and naked witches, and turns to her Crucifix to pray, having placed the candlesticks on either side of her on the floor (as demonstrated in the image above); why? At the Roman Catholic Mass, candles are light at both sides of the alter and stay lit until the Mass has been celebrated. Vanessa, then, in lighting these candles, is making herself an alter for God; how do we know that? These two candles are imperative for several reasons. First, as mentioned above, they make Vanessa a type of alter as is done during the Mass. Secondly, they are the same color as her gown, so she is burning brightly with the light. The flame of the candle is the closest we can come to understanding what the soul looks like: the body of the flame, the white part, is the color of the (redeemed and purified) soul; how do we know that? Because the soul is on fire with love for God to the point that we ourselves become living flames of love (and that's why Vanessa's gown is the same color as the flame, in this moment of darkness, she is on fire with love for God, EVEN IF she doesn't feel that way). But, why are there two candles? As mentioned, every Mass has at least two candles lit during the celebration (sometimes more). Two, as St. Augustine tells us, is an imperfect number, it is always trying to become one instead (as in the wedding vows, "That the two shall become one," because "one" symbolizes the ultimate "simplicity" [and this is a good thing] there are not working parts--like a car--or deception or separateness in it, it is entirely united and unified within itself, so "one" is a symbol for God). Vanessa is one of the candles, her soul that will become flooded with the fire for the love of Christ and completely purified, and the other candle is symbolic of the other soul she is to bring to Christ, just as we are all responsible for helping someone else to turn away from the world and towards God (in most situations, this is the person who is your spouse, like the debacle between Gladys and Malcolm at Mina's grave; Malcolm wants to reconcile, but Gladys refuses, even though she took the wedding vows with him, she is now saying that since there are no children, there is no "us," and she's committing a "grave" sin--putting herself in the grave just like Mina and Peter). This doesn't mean that Ethan and Vanessa are going to get married, but that Ethan chose the Tarot card for the lovers, because he is destined to become, not Brona's lover, but the lover of God, which is why one of the witches calls Ethan lupus Dei, the "Wolf of God," Ethan's sins will be used to give him a strong desire for salvation so that he will learn what love means through self-sacrifice, just as Vanessa is sacrificing herself now. Her blood is spilled out on the wood of the floor as Christ, the Sacrificial Lamb, spilled out His Blood upon the wood of the Cross; whereas Christ was raised up into the air for all to see, because His sacrifice was for all humanity, Vanessa's sacrifice will not be seen, it will be privately devoted and dedicated to Christ so she will stay lowly (that's why the blood is offered on the floor and not the wall, for example; please remember, the conversation at the beginning of the show when the Inspector is at the Maritime Inn inspecting the crime scene and what he says of wood versus brick: wood holds its character; that conversation was a direct foreshadowing of what we see with Vanessa). Now, from Night Work, the first episode of Season 1, we recall that before Ethan left Sir Malcolm's house, Vanessa asked Ethan to pick a card from her Tarot deck and he picked the card that had the scorpion on it, and that is the key to understanding this scene. As we know, the neck symbolizes what leads or guides us in life, like a leash around a dog. The poster above, from Season 1, shows Vanessa wearing a necklace of scorpions, and we weren't able to really discern what that meant, until the premiere episode of Season 2. The guiding factors in Vanessa's life, then, are the same we find in the zodiac sign of Scorpio, of which the scorpion is the symbol. Of Scorpio it is written: "They are interested in anything which is profound or mysterious, for taboo themes and the depths of being. Their interest is awakened where others turn away in horror or disgust." Sounds like Vanessa, doesn't it? We will be able to draw upon this knowledge to to see her working and how she plays her battles. The scorpion symbolizing the lovers, as Vanessa tells Ethan, harkens back to the ancient language of astrology and the sign of the zodiac of Scorpio; why? Scorpios are known to be enigmatic and attracted to darkness and secrets; the occult is naturally associated with them, as is regeneration, passion and death: everything about them is intense, and their emotions go from the highest heights to the lowest depths, just as we have seen with Vanessa. Scorpios are intensely loyal, as a rule, but they take a long time in learning to trust and deciding to give themselves; as Vanessa draws the scorpion on the floor in her blood, she is making the sign of the lovers (the one she told Ethan about) because she has finally decided to become the Bride of Christ; she knows that if she doesn't, she's going to become the slave of the devil, like Madame Kali. There is far more to discuss on this episode, but this is for the sake of the ambiguity of the scorpion symbol that has eluded us until now. This is Madame Kali's official Season 2 poster and we see her ring on the right hand, as opposed to the left hand. What does her ring mean/symbolize? We know that a ring in general is a sign of a covenant, which is more serious and binding than a promise or legal contract. the sharp teeth that come out of the ring, as we saw to kill one of the younger witches, symbolizes the appetites: Evelyn's appetites are eternally bound to the devil's appetites, to whom she has wedded herself, so the devil will fulfill her appetites, if Evelyn will fulfill his (in this case, the soul of Vanessa). Pitch Perfect 2 & Fat Amy's "Exposure"